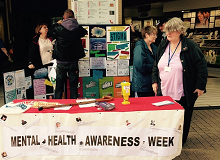 We set out into the market square of Stafford with a selection of posters and leaflets to highlight the importance of talking about mental distress, the struggles people experience, and the way in which the Social Hub can help to alleviate this distress. Click to visit the Staffordshire Newsletter to find out more. Guest artist, Helen Wilson collaborated with members to design a new pop up banner to promote the Social Hub and the new Create and Talk art group starting in January 2016. We received funding from Staffordshire County Council’s Community Arts Fund. Click to read our report. The Create and Talk group has now been running successfully for over a year. 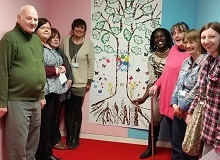 We recently got involved in a project run by Creative Health which gave our members the opportunity to work with professional artist Louise Blakeway. She taught a range of different and interesting skills from drawing and painting to collages and clay. Have a look at the video we were involved in to get more of a sense of what we got up to.